We know that mother's milk is the best source of nutrition for your baby, but you may not always be there to feed your child. With pigeon breast pump, maintaining successful breast feeding would be a breeze as the breast pump allows mothers to release and store breast milk. One hand system ease in handling with the ergonomically designed handle. 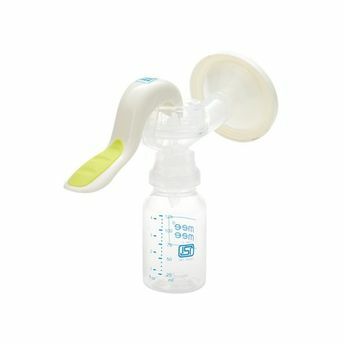 Completely adjustable pumping imitates baby's suckling pattern for a faster let down. Manually operated and light weight. The suction pressure of the breast pump is adjustable to suit every mother's comfort. Comfortable and successful milk expression the perfect sealing air cushion fits your breast perfectly by softly enveloping and gently stimulating the breast. Silent pumping full privacy during use. With the piped down design and functionality, the pigeon manual breast pump allows you to discreetly express milk wherever you are. Easy to assemble or clean and BPA free. Additional Information: Mee Mee is a well-known brand owned by Me n Moms Pvt. Ltd, which was launched in 2006 and promises to fulfill,The Joy of Parentingto every parent with their high quality and innovative baby and maternity care products that follow all safety norms and relevant safety standards. Explore the entire range of Breast Pumps available on Nykaa. Shop more Mee Mee products here.You can browse through the complete world of Mee Mee Breast Pumps .